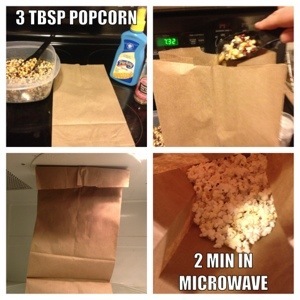 This is not a recipe, as much as it is a quick tip for making quick, cheap, low calorie microwave popcorn… How can you go wrong!? Simple. 1. Put kernels into bag. 2. Fold too of bag and crease. Should close but not be too tight. 3. Microwave 2 min, or until pops are 2 sec apart. Season with low calorie spray butter and sea salt, or your favorite seasonings. My husband is a fried rice aficionado. He orders it every.single.time we go to any Asian restaurant. He says this was just as good as most restaurants. I thought it was pretty good too. I hope you like it. VF: Omit chicken and add chopped broccoli and water chestnuts to make this vegetarian friendly! 1. Heat oil in a large skillet. Cook onions and chicken until chicken is cooked through. 2. Add mushrooms to the mixture, and stir until mushrooms are cooked. Add Peas and stir. 3. Once peas are warmed, add rice and scrambled egg. Cook about 2-3 minutes, stirring regularly so egg can mix in and cook. Add soy sauce, and mix thoroughly. 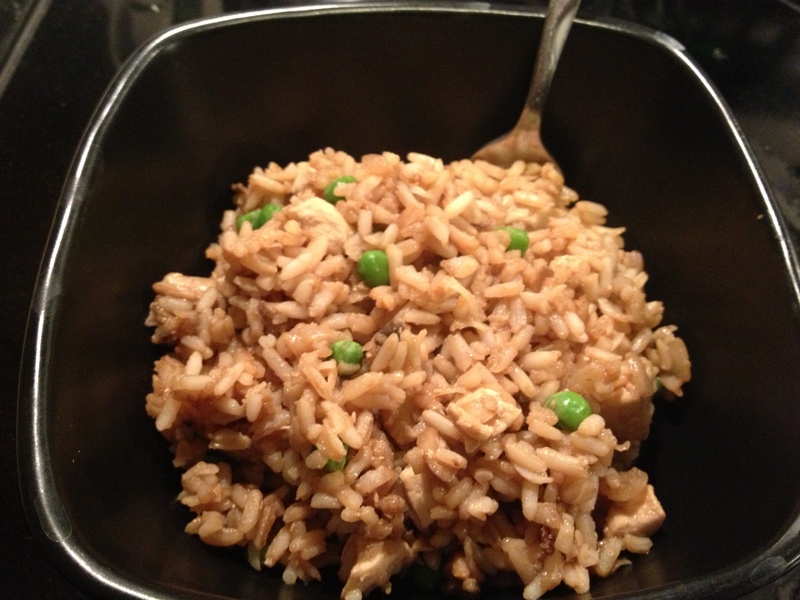 Editors Note: I’ve tried other fried rice recipes, and they never were quite right. The trick is that the rice has to be cold. Day-old rice works the best. I just make it the night before. I highly recommend this. 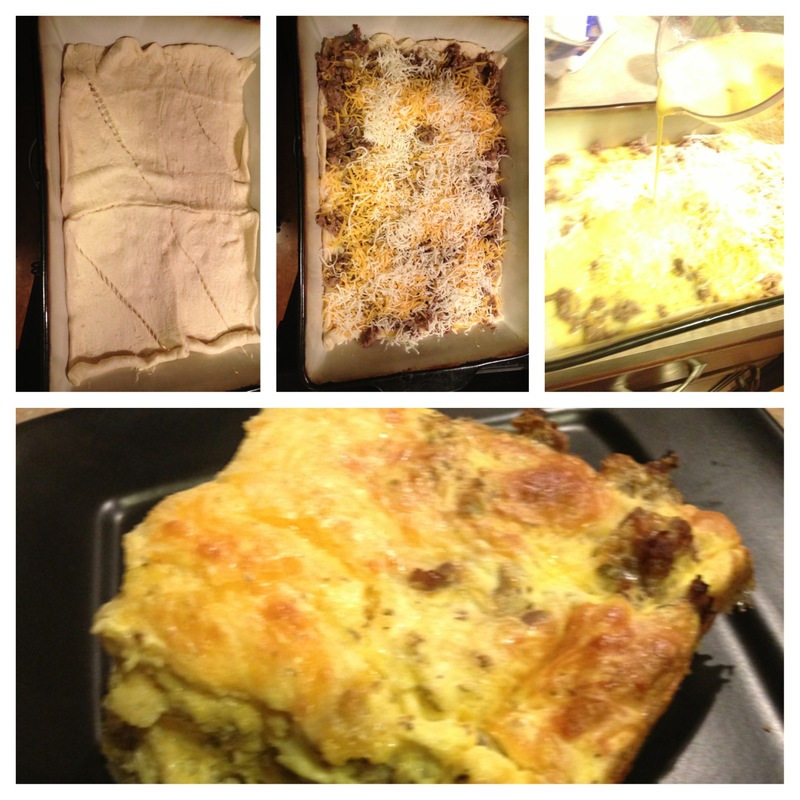 I’ve tried the full fat version of this, and then I took that recipe and turned it into the low calorie version below. I actually prefer the low calorie version, and although it’s a little more calories than I’d eat at breakfast, you could either have a smaller portion, or a lighter lunch. I, on the other hand, like to make breakfast for dinner…so this works out great for us. 1. Brown sausage in a skillet. 3. Spread sausage evenly across crescent layer, and spread cheeses over sausage. 4. Mix egg beaters, salt, and oregano. Pour evenly over the top of the casserole. 5. Cover with foil, and bake. ceramic pan: bake at 400 for 15 minutes. Uncover and continue to bake 10-15 minutes, or until middle of casserole is springy, and bounces back when you touch it. Glass pan: cover with foil and bake at 350 for 25 min. uncover and continue baking additional 15-20 min. Note, I’ve made this several times, and the cooking time has been a little different each time. Keep an eye on it to be safe. Editors Note: Try adding some mushroom, tomato, onion, spinach, etc for something different. 1. Combine Breadcrumbs, Cornmeal, Parmesan Cheese and remaining spices in a freezer size ziplock bag. 2. Pour buttermilk into a small dish. 3 pieces of chicken at a time, cover pieces in buttermilk, then add them to the bag of coating. Shake until all 3 pieces are fully coated. 3. 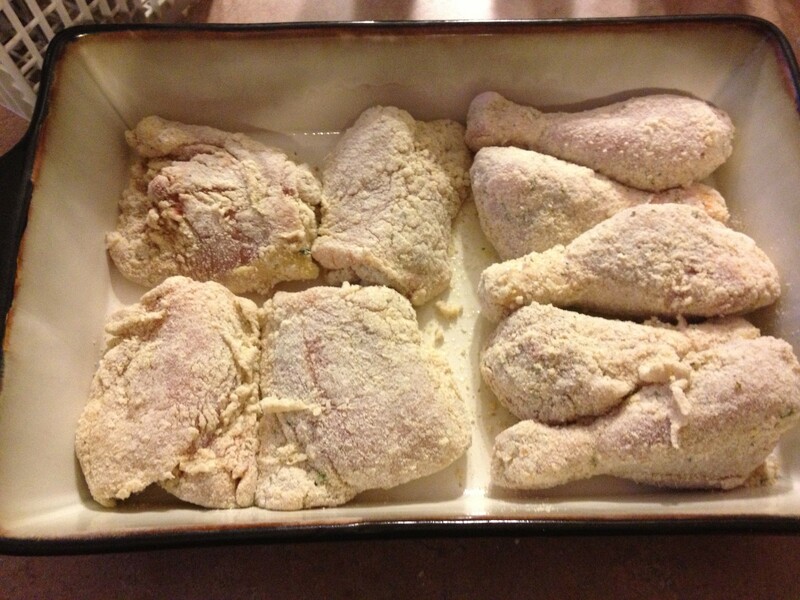 Place chicken pieces into a 13×9 pan that has been sprayed with non-stick spray. 4. Bake at 375 for 15 mintues. After 15 minutes, remove pan and drizzle chicken with melted butter. Return to oven. 5. Continue baking an additional 30-40 minutes or until done. Check internal temp with a meat thermometer. Chicken is done at 180 degrees. 6. You could stop here, but I wanted some more color, so I left under the broiler a few minutes to achieve a nicer brown. Just personal preference. So this totally is not a recipe. 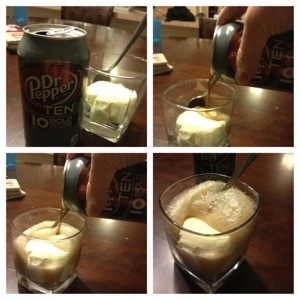 Just a great way to satisfy a not-great-for-you craving. They make these 10 calorie sodas in many flavored, including root beer if you’re into that kind of thing. They are much better to me, than a true “diet” soda. I’m not posting directions here 🙂 I have faith you all know what to do! Enjoy. * I chose to use a mix of both parmesan cheeses (the shredded kind and the powdery kind) because I have them both on hand, and I like the combination of textures in this. You could sub 2/3 of a cup of whatever you have on hand, if you don’t want to purchase both types. 1. Mix cheeses, Italian herbs, salt, pepper, and red peppers in a shallow dish. 2. Lightly press each fillet into the mixture, on both sides. Press just hard enough to make it stick to the fish, which should be slightly wet. 3. 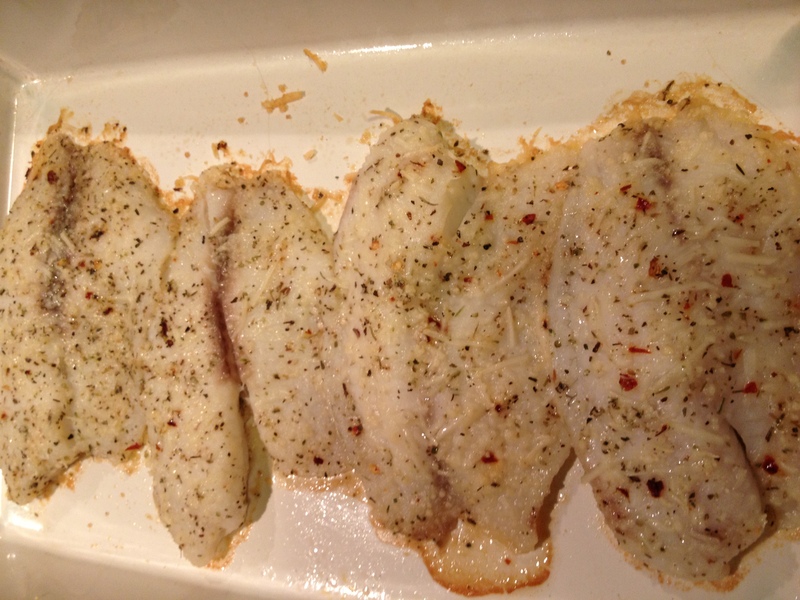 Line your fillets in a 9×13 pan, sprayed with nonstick spray. 4. Bake at 425 for 12-15 minutes, until done. Cooks Confession: I hate the smell of fresh fish cooking in my house. I just can’t do it. 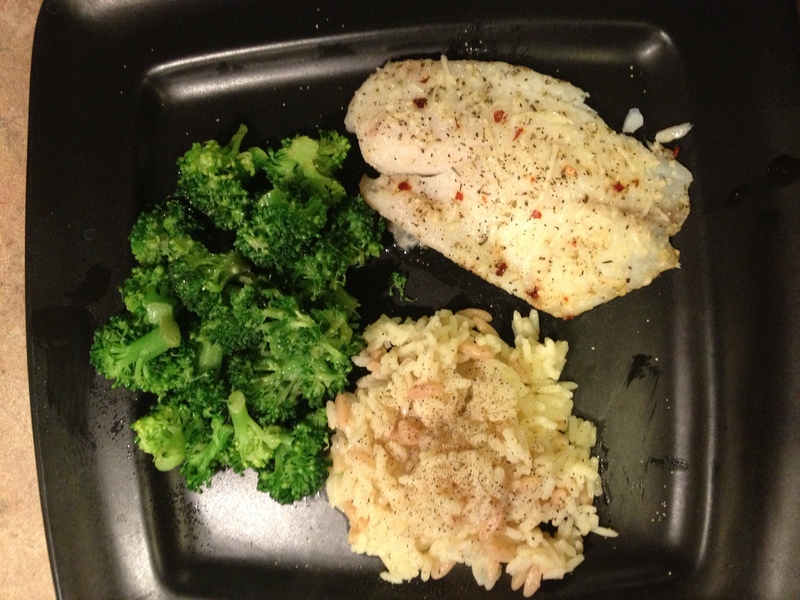 So, I prefer to use frozen tilapia fillets, which I believe turned out pretty awesome, and were much less expensive. If you go this route, thaw the fillets before cooking. I also regularly use frozen mahi mahi fillets, which are also good. check out my blackened mahi recipe here. So, I originally forgot to take a picture of this one, but i have great friends who take my word and try my recipes without photo evidence that theyre good. 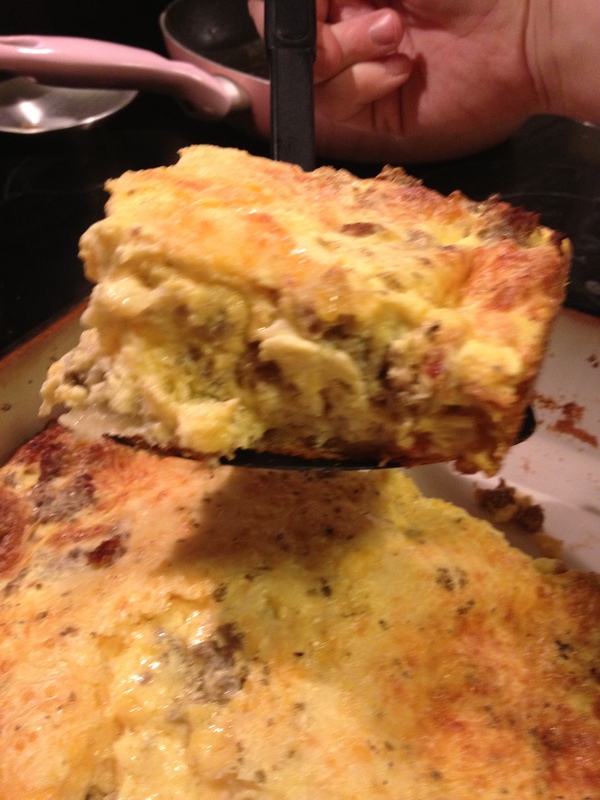 this picture is courtesy of my friend Robin, who, incidentally, loved the recipe! My daughter is already asking when I’m going to make this again. Was great leftovers too. – 1/2 lb boneless, skinless chicken breast. Cubed into about 1/2 in x 1/2 in. – 12 oz of turkey smoked sausage, cut into 1 inch slices. 1. Place everything above, starting with chicken, and ending with oregano, into your crockpot. If you have a textural issue with somewhat crunchy onions… throw those into the microwave for 25 seconds in a bowl before adding them. 2. Cook on low 6-8 hours, stirring periodically. 3. Cook rice according to package. 4. 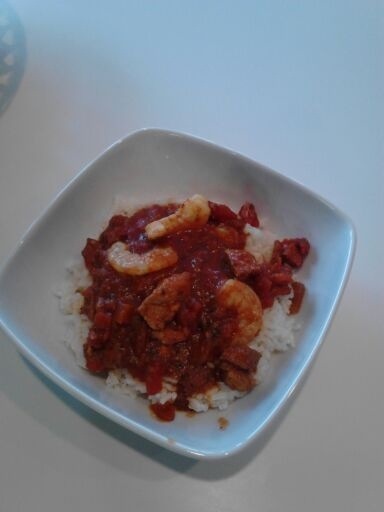 15 min prior to serving, stir in cooked rice and shrimp. When it’s all stirred up, cover, and allow to cook remaining 15 minutes before serving.